I'm sorry for going quiet so suddenly. I'm still adjusting to the new schedule and the last week was very intense at work. We have lots to do (which is a good thing) but I have much less time to reload my batteries due to longer commute. I must find a solution to that because I can't go on much longer feeling like a zombie. I want to do fun stuff at home, not just sit in front of the computer and read blogs or Ravelry forums while listening to audiobooks because I have no energy to do anything else. Some nights I don't even knit! I did knit some in January: a Happy Hat, a Karelia, a simple scarf for LB for catsitting over Christmas, two squares for Pratchghan and several washcloths. Small, quick things that don't take much brain power. Pratchghan is a project of Ankh-Morpork Knitter's Guild* to knit a blanket for Terry Pratchett with text "I aten't dead" on it. The project was a reaction to his announcement that he has Alzheimer's and specifically to the way he worded the announcement. I got to knit two squares because I volunteered to knit/crochet a letter for the text and the project coordinator decided that those who make a letter should be able to make another square of their own choosing. I happened to be the first one who mailed the coordinator for a character so I got the "I". 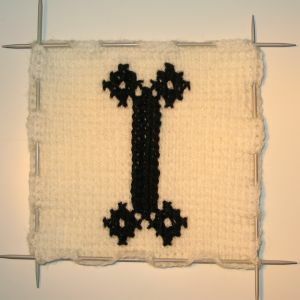 I didn't trust my intarsia skills, but used tunisian crochet instead to make the white base and embroidered the black letter on it with long-armed cross stitch. 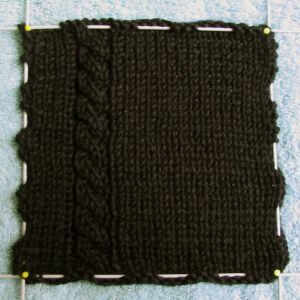 I had problems deciding what to knit for the Discworld theme square and finally settled for the black off-centre cable to represent Death's realm. I know that the squares don't look white or black, this was the best I could do with an ailing camera, winter sun, north facing windows and Gimp. * A group of Terry Pratchett fans on Ravelry. I hope that I get some energy somewhere because there's so much I want to do and make.